What is the purpose of the Split Sleeper Berth rule? The Split Sleeper Berth provision means flexibility for a driver. It allows a driver to split the required 10 consecutive hour off-duty break into two shifts. One shift must be between 2 and 8 hours, and can be spent in the sleeper berth or off duty (or a combination of the two). The other shift must be between 8 and 10 hours, spent entirely in the sleeper. 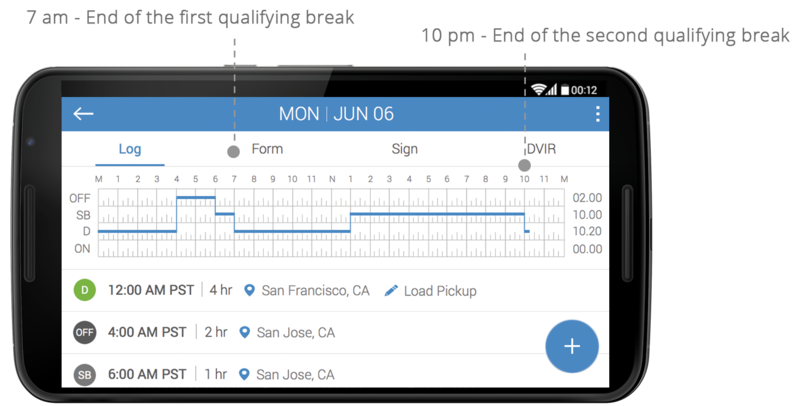 If you spend 10 or more hours in the sleeper berth, it can be interpreted instead as a full 10 hour off-duty break to your 14 hour driving window. The two breaks can be taken in either order. Successful completion of both the 2-8 hour period and the 8-10 hour period will give the driver a new starting point for the 14 hour driving window. Now, the starting point of the 14 hour window will begin at the end of the first period, no matter which came first. Since the new 14-hour driving window does not start after the end of the second period, the split sleeper berth is not a full 10-hour reset. Rather, it simply moves forward the point at which the 14-hour driving window started. You come on-duty at 12 A.M. and drive for 4 hours, but realize you feel a bit fatigued and could use a short break. You take a 3-hour break at 4 A.M. and spend 2 of those hours off-duty and 1 hour in the sleeper berth. You have now completed one of the required breaks and have 7 hours remaining in both your 14-hour window and 11-hour drive time. You jump back on the road at 7 A.M. and drive for 6 more hours, at which point your driving window and 11-hour drive time are almost up so you decide to take your second break. You spend the required minimum of 8-hours in the sleeper berth, which completes the second requirement for the Split Sleeper Berth provision. You can now retroactively apply the new 14-hour window and 11-hour drive time to the end of the first qualifying break at 7AM.